Before heading out on a road trip tracing part of old Route 66, I thought I knew what to expect. My mental images included cars from the 1950s and ’60s polished to a mirror-like shine; kitschy roadside attractions; and elaborate neon signs competing with the sunset for dusk’s glory. Piney forests and jagged peaks. 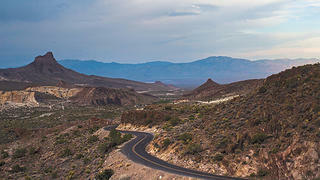 Painted deserts and red-rock canyons. The iconic image of the open road: a band of asphalt disappearing on the horizon. For about 400 miles through the colorful sands and boulder-strewn vistas between Santa Fe, New Mexico, and Flagstaff, Arizona, I joined the National Trust for Historic Preservation’s July 2018 road trip—a month-long campaign tracing old Route 66 from Chicago to Santa Monica, California. Sponsored by State Farm along with support from Sonic, Airstream, and Polaroid, as well as a writer and photographer for National Geographic, the excursion’s goal was to revisit the roadside icons of yesteryear and build public excitement for possible Route 66 National Historic Trail designation. A car and Paul Bunyan statue near Route 66. 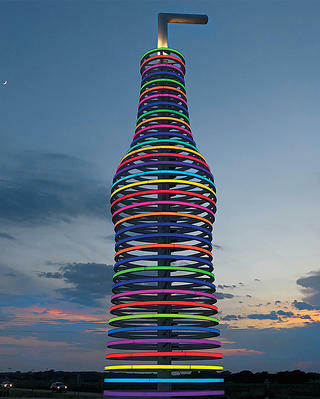 A neon soda bottle at Pops in Arcadia, Oklahoma, a newer Route 66 cafe established in 2007. Created in 1926 by linking a series of roughly east-west pre-existing roads and trails, Route 66 was originally established to provide a direct, year-round connection between the Midwest and the Pacific Coast. Passing through Illinois, Missouri, Kansas, Oklahoma, Texas, New Mexico, Arizona, and California, the highway eased the transportation of goods, encouraged domestic tourism, and further facilitated large-scale settlement of the West. By 1938, it became one of the first interstate highways in the country to be completely paved. Big cities such as Chicago, St. Louis, Tulsa, Albuquerque, and Los Angeles were more connected, and with more and more people traveling the road, communities along the route flourished. Gas stations, motels, mom-and-pop shops, restaurants, and roadside attractions sprouted up along the empty stretches of road between towns. During the route’s heyday, it exposed travelers to everything from internationally significant places like Chicago’s majestic skyline and Eero Saarinen’s Gateway Arch in St. Louis to unique, attention-grabbing structures like a tilted water tower dubbed “The Leaning Tower of Texas” and the world’s largest catsup bottle in Collinsville, Illinois. But when new interstates ultimately bypassed the old road altogether, many small businesses were forced to close. Of those that remained, many placed bets on the promise of tourism—doubling down on quirk and curiosity. “In economically challenged rural areas where traffic has been rerouted to interstates, it was difficult for businesses to stay viable,” says Webb. Much of the original Route 66 highway conformed to the natural landscape in a way that newer interstates do not, giving travelers a visceral appreciation for the country's diverse terrain. Decommissioned in 1985, Route 66 remains a pop culture icon of titanic proportions. The lure of the open road draws travelers from around the planet, and road trip adventures have been popularized in film, fiction, television, and song. And despite a return to its origins as a hodgepodge of secondary highways and local routes, a trip down memory lane is still possible for anyone willing to spend the time mapping out directions. 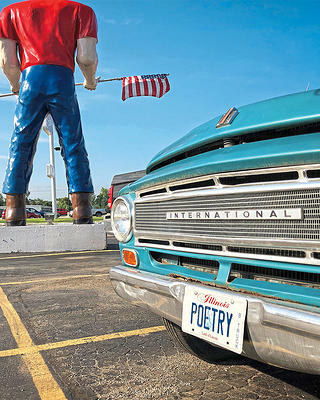 “Although it is no longer an official U.S. highway,” says Webb, “in many of the smaller towns, Route 66 is still the biggest economic generator.” As such, the National Trust is partnering with Route 66 business owners and enthusiasts, nonprofit organizations, and state and federal agencies to invigorate this long stretch of Americana. By commemorating Route 66 and capitalizing on its cultural value, once-prosperous towns along the Mother Road may thrive again. Though my road trip covered less than 20 percent of the total route, I was amazed by what I discovered. While I saw everything I expected in abundance, the overall experience added up to so much more. What delighted me most about traveling the Mother Road were the places I didn’t expect, the chance encounters along my journey, and the ways they expanded how I think about our nation. Looking back now at my brief tour, I recognize that Route 66 taught me less about history than about myself and my fellow Americans. In a time when this country is so polarized, it was refreshing to connect with folks who weren’t thinking about geography solely in terms of the reds and blues on an election map. At the Laguna Pueblo’s San José Mission, for example, a local named Alfred offered me a tour and history lesson. I learned that the Pueblo peoples were traditionally agricultural, so they stayed near their farmland, establishing villages with permanent structures made from adobe. The mission, which was built by the Pueblo of Laguna in 1699, fell into disrepair by the late 1800s and was being used as a corral. A church official stepped in to make repairs, but by the 1930s an extensive rehabilitation of the centuries-old adobe structure became necessary. Toward the end of our visit, Alfred took out a traditional wooden flute and asked if he could play me a song. “I wrote this for my mother when she was dying of diabetes,” he said. “And now I’d like to play it for you. I call it ‘Mother Song.’” As he began to play, thunder cracked from a storm cloud outside, and he paused for a moment as we made eye contact and looked toward the sky. Then, each note seemed to emerge from somewhere below the packed-earth floor, floating into soft echoes, before vanishing back into the adobe. A couple hours’ drive from the Laguna Pueblo, the Petrified Forest National Park protects one of the world’s largest concentrations of colorful petrified wood, and it’s a must-see for any Route 66 road-tripper. Before entering the park, I took a break at a rest stop and met a retired cop in his late 70s on the home stretch of a trip from California to Charleston, South Carolina, and back. We talked about his bike, the cost of motorcycle maintenance, the best place to buy tires online, how many miles he rides each day and at what speed, the various modifications he made to his bike for long-distance comfort, and his years on the California Highway Patrol. I marveled at the notion of riding across the country in three days on a motorcycle. At the Enchanted Trails RV Park in Albuquerque, New Mexico, travelers can reserve an RV site or stay in one of five available vintage trailers on location. The 1954 VaKaShunette shown here is not available for rent. On the New Mexico-Arizona border, I chatted with the owner of Chief Yellowhorse Trading Post about Navajo history, cliff dwellings, and petrified wood. At the Wigwam Motel in Holbrook, Arizona, a guy named John overheard my colleagues and I talking about the hard-to-find and long-abandoned Painted Desert Trading Post and offered to show us the way. In Winslow, Arizona, a town made famous by the Eagles song “Take It Easy,” a woman from Washington State who had recently moved there was hoping to capitalize on Route 66 tourism with her newly opened vacation rentals in a converted historic church. 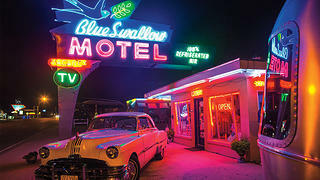 The Blue Swallow Motel in Tucumcari, New Mexico, has been serving Route 66 travelers for nearly 80 years. Near Peach Springs, Arizona, Route 66 tourists can play a round of desert miniature golf. 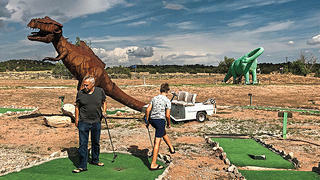 The dinosaur-themed course is located outside of Grand Canyon Caverns, which features lodging deep inside the caverns. 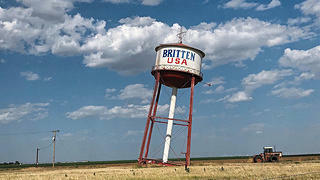 Known as the Leaning Tower of Texas, this former water tower was installed as a tilting roadside attraction and advertisement for a truck stop that once operated in Groom, Texas. 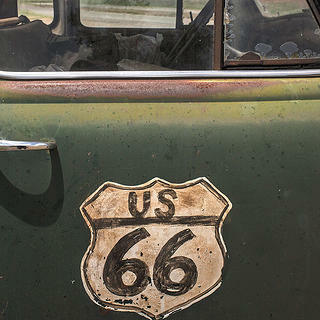 Today, although it’s true that U.S. Route 66 no longer officially exists, that’s just a technicality. The people won’t let its spirit die. Travelers, Route 66 devotees known as “roadies,” business owners, historians, and entire towns maintain and shape the Mother Road’s lore. 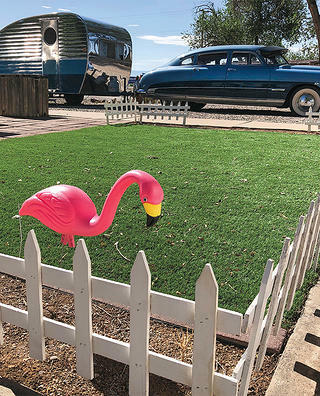 The places on Route 66 compose a quirky, complicated, brightly hued slice of Americana. Giant dinosaurs, Paul Bunyan statues, neon signs, and a tilted water tower capture the world’s imagination, but the people you meet are the real story. They know the history and will define the road’s future. They’ll remind you that maybe hitting the road is the best way to find common ground.